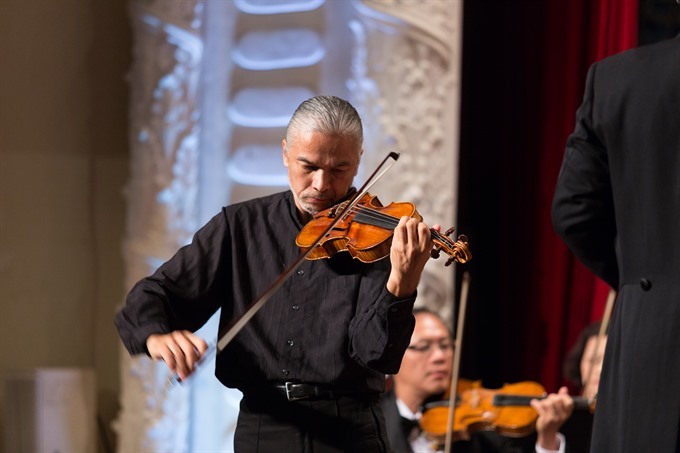 HCM CITY — Vietnamese-French violinist Stéphane Trần Ngọc will perform in a concert featuring pieces by Shostakovich and Elgar at the HCM City Opera House on May 9. The Violin Concerto No 1 in A Minor by the Russian composer Dmitri Shostakovich, written between 1947 and 1948, consists of four movements. It premiered at the Leningrad Philharmonic under conductor Yevgeny Mravinsky in 1955. The work was well received and became one of the most performed works of famous violinists in the 18th century. Ngọc, who is head of strings at the London College of Music, will perform on a violin made in 1709 by Venetian violin-maker Francesco Gobetti. He will appear with the HCM City Ballet Symphony Orchestra and Opera (HBSO) under the lead of veteran conductor Trần Vương Thạch, HBSO’s director. The concert will also feature Serenade for Strings in E Minor written by English composer Edward Elgar in 1892. Paris-born Ngọc graduated from the Paris National Superior Conservatory of Music when he was 15. He received a master’s degree from Brooklyn College’s Conservatory of Music and a doctorate at the Juilliard School in the US. He has won top prizes at several international competitions, such as the Lipizer Competition and the Long-Thibaud 1990 International Competition. Ngọc has performed as a soloist in over 30 countries, with the Radio-France Philharmonic, the Monte-Carlo Philharmonic, the Danish Chamber Players and the Shinsei Symphony Orchestra, among others. He has worked as a violin teacher at the National Conservatory of Music and Dance in Lyon, France, and the Lawrence University Conservatory of Music in the US.